Book a cheap ferry to Singapore online. 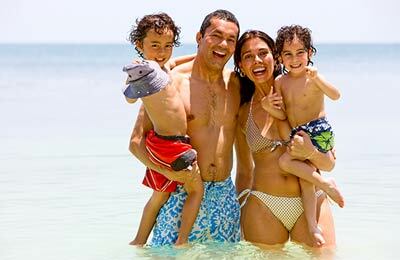 Find the best deals by comparing ferry companies. You can use AFerry to book ferries to Singapore from Bintan Island and Batam in Indonesia. Using AFerry will always get a great deal on your ferry to or from Singapore. See below for timetables and the latest special offers. Booking a ferry to or from Singapore couldn't be easier with AFerry. You can either use the booking form at the top left of the page. 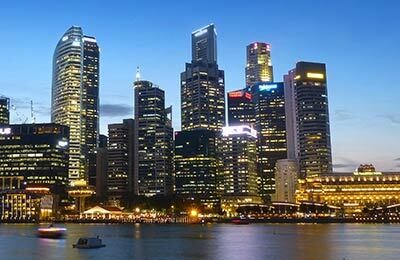 Singapore is made up of 63 islands in South East Asia and lies 85 miles north of the equator. Singapore has a population of just over 5 million, with the main spoken languages being English, Chinese, Malay, and Tamil. The most popular past-times in Singapore have to be dining and shopping. Due to the ethnic diversity in Singapore a wide range of cuisine is available, making it a great place to try new foods. Make sure to leave some room in your luggage to bring things back because there are many shopping malls to tempt you. To curb congestion and pollution, cars are a restricted and therefore expensive method of travel. The best way to get around is by bus or train. Taxis are available and these are relatively cheap in comparison to other developed countries. 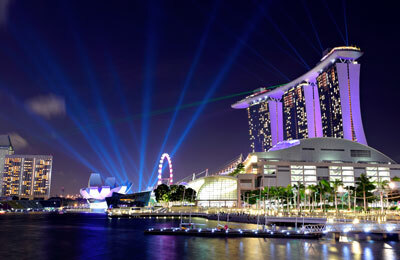 Singapore is a vibrant, cosmopolitan city-state, famed for a rich diversity and stunning architecture. Singapore started life as a small fishing village. Since then, times have changed somewhat as today the area is growing both upwards and outwards in terms of both population and land mass - Singapore is well known for its high rise buildings and reclaimed land, most notably the man made beaches. One important thing to note is that the government in Singapore has strict rules to keep the country clean, for example littering can land you a 500 Singapore Dollar fine, which equates to over £250. It's a high penalty but it does its job, making a better environment for both locals and tourists. Cars are very expensive to own in Singapore, due to government rulings aimed at minimising pollution and congestion. Tourists benefit from this because it means that public transport is a much more effective way of getting around. If you are short for time then taking a taxi is also a great option, these services are cheaper than you may be used to in similar developed countries. It's said about a lot of destinations, but there truly is something for everyone in Singapore. Art afficianados will be in their element with art museums and galleries to look around during the day, and exciting performing arts productions to see at night. Those seeking nightlife will not be disappointed as Singapore takes on a new persona as darkness falls. You will find chilled out bars where you can share a bottle of wine over a good conversation, local music events with a vibrant cultured feel, or you can head to a nightclub for live music and a night-long party. Singapore is a great place to visit for an active holiday. There are many sports available to do, some of which you may not have expected - winter sports. The Snow Dome is well worth a visit and will help you take a break from the natural tropical climate. AFerry offers the best way to find the cheapest ferry routes to Singapore with its easy to use booking form. Begin your holiday on a ferry and start relaxing straight away!